Juicing vs Blending: What's the Best Way to Drink Your Greens? You are here: Home / Nutrition / Food & Drink / Juicing vs Blending: What’s the Best Way to Drink Your Greens? Juicing vs Blending: What’s the Best Way to Drink Your Greens? We all know how healthy eating raw, fresh, organic greens can be. In fact, eating them is essential for anyone who wants to become and stay healthy − no matter what your situation. In the midst of our busy lives, consuming those daily greens in some kind of liquid form just makes sense. After all, who wants to lug around pounds of spinach or kale all day? But what exactly is the best way to drink your greens − blended or juiced? I’m frequently asked this question about juicing vs blending as I coach and speak to women on the 7 Essentials System™ of healing the body naturally. The answer, in my opinion, is both. And it all depends on where you are right now on your healing path. Juicing vs Blending… When to Juice? Juicing is done using a machine, either electrical or mechanical, to grind, pulverize, and squeeze liquid out of your fruits and veggies. The fibrous tissues of the plants are not consumed, but instead discarded. If you decide to juice for a short period of time because of any of the above reasons and want to include fruits in your juicing, always make sure that they are low-glycemic, such as blueberries, lemons, or green apples. Since digestion begins in the mouth, make sure to swish the juice around in your mouth before you swallow to activate salivary enzymes. The excretion of these enzymes are an important part of the first steps of digestion. 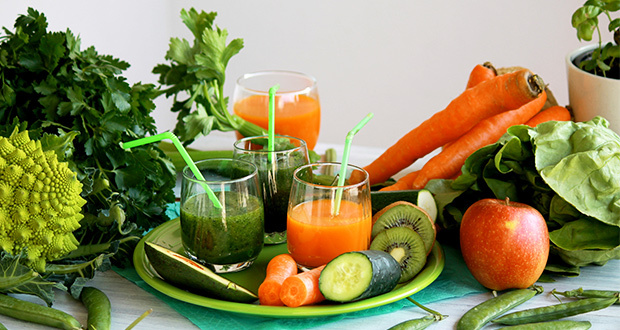 Blending involves using a blender or other high-powered device to grind down green leafy veggies like kale and spinach, low-glycemic fruits, root herbs like ginger, and other vegetables. Blending uses the whole plant, stems and all. 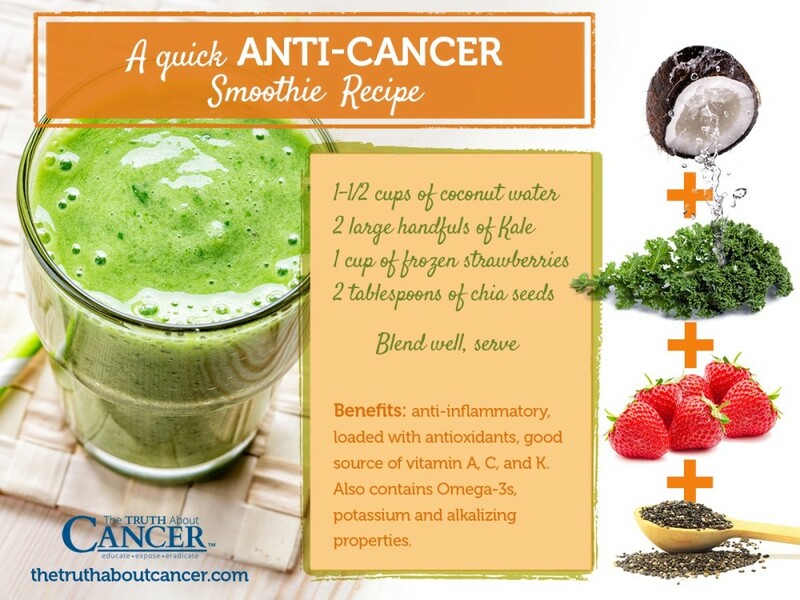 The end result is a thick drink that is satisfying, nutrient-dense, and delicious. In contrast to eating a salad, blending also allows your body to assimilate more nutrients. The blender will break down plant cell walls, releasing antioxidants and making your greens easier to digest. A blended drink is sometimes called a “smoothie.” Just to be clear, however, there is a difference between the kind of healthy blended drink I am talking about and the “smoothies” that you may find at Starbuck’s or even at a “smoothie shop.” Those offerings are often loaded with high amounts of sugar and other unknown, processed substances. In fact, according to the ingredient information found on their own website, a strawberry smoothie from Starbucks has a whopping 41 grams of sugar, about the same amount that is in a can of coke. Even Jamba Juice’s popular Tropical Greens has about 30 grams of sugar. And don’t even get me started on Smoothie King. They don’t divulge much of the specific ingredients nor sugar levels for their “proprietary blends” on their website. In addition, each one of their smoothies includes turbinado sugar. To be sure, the best smoothies are the ones you make yourself in your own home with just a few organic ingredients and the right kind of blender. When you are blending, make sure you use mostly green leafy vegetables like kale or spinach. You can combine leafies with fruits, but make sure that they are low-glycemic such as apples or blueberries. Sticking with leafy greens (as opposed to vegetables like broccoli or cabbage) in combination with these fruits will eliminate the digestive upset that can sometimes happen when you mix high-starch vegetables with fruit. Even mixing low-sugar content fruits with veggies like beets or carrots can cause bloat in extra-sensitive people. Boutenko came to the eventual conclusion that green leafies were the victims of gross misrepresentation. According to her, leafy greens are not really “vegetables” in the way that squash, beets, carrots, broccoli, and the like are. Greens differ in that they simply do not have the starch content that these other veggies have. In fact, the high fiber content of green leaves actually help to slow down the absorption of fructose, making them an excellent pair for fruit. No doubt the juicing vs blending debate will continue. Whatever way you choose, however, one things is crystal clear − making juicing or blended green smoothies a regular part of your diet will not only give you plenty of plant-based nutrients, it will also give you the healthy, sustained energy you need for a productive day. Eating raw, fresh, organic greens is essential for anyone who wants to become and stay healthy. With our busy lives, consuming those daily greens in some kind of liquid form makes sense. Which is the best way to drink greens − blended or juiced? The answer is both, and it all depends on where you are right now on your healing path. A blended drink is also called a smoothie. The best smoothies are the ones you make yourself in your own home with just a few organic ingredients and the right kind of blender. Commercially-made smoothies often contain as much sugar as a can of Coke. Can you address what kind of blender is good to use for smoothies or perhaps in another article? Would u suggest same for juicing? I’m 29 yrs old (mother of 2 boys 4&8 yrs old). DX w/ hodgkins lymphoma 4/2015 & sentenced to abvd chemo. I had last infusion 10/2/15 but I’m not feeling any different than I had during chemo! It’s been half a yr now & I’m just so scared & angry I may never be who I am or who I was pre-chemo! I didn’t even have any symptoms yet as far as I could tell at the time but I know better now???? Either way I was definetly WAY healthier feeling, happier, cognitive, and energetic before I was poisoned ???? What about the impact of heat on the enzymes? I was told that cold-pressed juices result in more active enzymes as the heat generated by a blender tends to destroy enzymes quickly. Is that not a factor to take into consideration? Omega Juicers 8600 does not heat up the juice. I need to do more research, a comment was left that Wheat Grass was breaking the screens, so I’m looking for something comparable. Blenders heat up the juice. Blenders are good for you smoothies w/ice. Hi,I have recently been diagnosed with prostate cancer at the age of 63,and have been given the Truth About Cancer website which I’m finding so amazing.I always have a bowl of fresh fruit for topped with flaxseed seed oil and leciten for breakfast and have done for the last 30 odd years and over the last 2years having a home made smoothie(nutra bullet)consisting of vegetables, berries,apple,red grapes seeds and nuts,I’m concerned that I’m now getting to much sugar in my diet from the fruit I’m eating as I’ve found out that sugar feeds cancer.I have pretty much cut out all processed food from my diet of late and having lots off salads.Can you please advise me. Hi Allan, It sounds like you are on the right track! Prostate cancer is actually very similar to breast cancer so you may find my book helpful. Here is a link: https://breastcancerconquerorshop.com/product/heal-breast-cancer-naturally/. I also recommend minimal fruits and stick with the low-sugar ones, such as green apples (great in smoothies), lemons and blueberries.